"I'll never understand French people's love stories. There's nothing but folly, fury and suffering." Amen, sister. Regis Warginer's Indochine is a love story that really only could come from France. It takes place in a world of entirely heightened drama, dropping you off not only in French Indochina during the independence movement that would lay the foundation for the Vietnam War, but in a parallel, and distinctly French universe. Here lost love, dangerous affairs, personal betrayal, murder and suicide vie for attention with a grand struggle for freedom. It�s the sort of lush, historical epic that screams Sony Pictures Classics, and here they pull out all the stops. There�s even an opium den or two thrown in for good measure. Catherine Deneuve stars as Eliane, the stolid owner of a rubber plantation. To her workers (little more than slaves, really), and to most of French society, she�s the epitome of the French ruling class. She lords over her plantation with a stern, but mostly benevolent hand. Things begin to fall apart in her life just as they do in the country: she begins an oh-so-doomed romance with an ambitious but melancholy French sailor, Jean-Baptiste (Vincent Perez). In quick succession, her affair falls apart, and her adopted Indochinese daughter unwittingly falls for the same guy. The ensuing love triangle brings all three straight into the middle of the conflict that would be the beginning of the end for French rule. Generally, the two storylines mesh well. At times, though, it can be a little hard to truly care about the travails of Eliane. The movie does a great job of showing the genuine oppression that the locals face at the hands of their French masters, and, while keeping the blood to a minimum, most of these scenes are wrenching. For the landowners, the locals are at best children to be controlled and disciplined, at worst slaves. The rebellion heats up at the fringes at the movie, and sometimes you feel stuck watching Eliane's overheated love story. Still, there's a real Dr. Zhivago feel here, and in that genre of the historical-romantic epic, this one works, if not flawlessly. And things do pick up as her daughter takes off with Jean-Baptiste into the heart of the burgeoning communist movement. There�s plenty to enjoy, and if nothing else it provides a unique perspective on the development of communist Vietnam. The colonialists are so outright nasty (in the movie and in history) that it's much clearer than it ever has been in my mind why communism as a unifying ideology would have taken root. To many, I think, it seemed much better than the status quo. 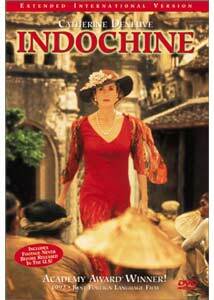 Quibbles with the story aside, Indochine is absolutely gorgeous to watch. There's an almost Technicolor-like brilliance to the color palette, which more than any other factor makes the film impossible to turn away from, despite its long running time (and on this extended edition the running time is, make no mistake, long). The costume design, cinematography, and exterior visuals are likewise stunning. Pretty and talented actors are just icing on the cake-when Catherine Deneuve is on the screen, she's quite a force. Simply put: this movie is darn pretty. Image Transfer Review: A bit of a mixed bag: the visuals in this movie are gorgeous, but there's a lot of fine grain present that would have you believe that this movie came out earlier than its 1992 American release. It's not particularly noticeable in the numerous bright daytime scenes, but becomes quite apparent during dim or nighttime shots. Not bad, but a popular epic like this probably deserves better. Audio Transfer Review: There's only a 2-channel track here, and it gets the job done surprisingly well, but for a big movie like this, a full 5.1 experience would have been appreciated. The music is often cranked up so loud in the mix that it becomes distracting at times, and actually startling at others. Extras Review: Not much. A couple of trailers, neither of which are for Indochine itself, and some Talent Files that are really just screen bibliographies. Interestingly enough, the packaging lists Production Notes, usually a filler extra anyway, but these are nowhere to be found on the disc itself. For the look alone, Indochine earns the title epic. There's a delicate balancing act between the personal and the monumental here, and sometimes the scale gets tipped into heavy, heavy melodrama, though I wonder if others might have enjoyed more of the personal story. Regardless, I sat down to watch the thing and didn�t stop for 2 hours and 38 minutes. Though I would expect that someone would want to put some effort into a better disc someday, this particular presentation gets the job done.